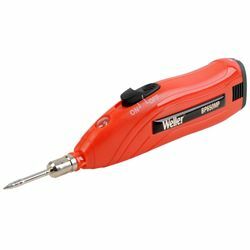 Weller's cordless soldering iron rapidly heats to 900° F in less than 30 seconds. It's ideal for electronics, home wiring, robotics, RC cars and more. It's cordless, so it's well suited for cramped or awkward work spaces. Three AA batteries deliver up to 4.5 watts of heat and should be good for about 120 joints. Includes a conical soldering tip, 3 AA batteries, a tip wrench and up to 120 soldering joints.